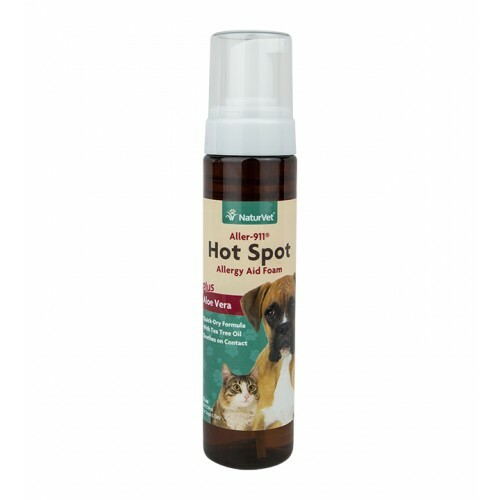 Aller-911® Hot Spot Foam with Aloe Vera quickly helps to relieve itchy, irritated skin while the bittering agent helps to deter gnawing and chewing. The quiet foam application is ideal for pets sensitive to sprayer noise. This gentle, quick-drying formula eliminates the need for ointments and gels. Aller-911® Hot Spot Foam can be used with spot on flea products. Shake gently. Apply 1 - 3 pumps on itchy, scaly or irritated areas of the skin. For optimal results pat softly to evenly distribute product. The quick dry penetrating formula can be used up to three times a day or as needed. Avoid contact with eyes. Polysorbate, Chembetaine, Sodium Benzoate, Citric Acid, Potassium Sorbate, and Deionized Water.For use on dogs and cats.